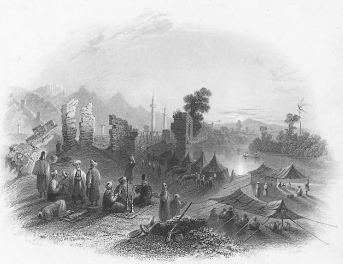 In happier days: encampment of pilgrims on the road to Mecca, 1836. Ragia Abdullaeva, 67, spent three years preparing to visit the birthplace of the prophet Mohammed in Mecca only to see her dream shattered this year. It took her and her daughter 3 years to save the 1000 US dollars she needed for the trip. “I really looked forward to my pilgrimage; all my family and friends encouraged me,” said Ragia. But a few days before the planned trip, all 286 clients of Tur Ltd were denied Saudi entry visas. Abdullaeva was among them. Tur Ltd and two other private tour operators – Karvan-D and President – have been authorised to sell pilgrimage packages since 2002, wooing clients by offering low rates; one of the reasons why Abdullaeva chose a private operator. Some of her friends had gone on a Haj through Tur Ltd the year before, and spoke favourably of the firm, saying they had spent several hundred dollars less than they would have if they had gone through the Muslim Religious Authority of the Caucasus, a body seemingly seeking to monopolise Haj services. Haji Solmaz Hanum, who has been to Mecca five times, said it costs no more than 700 dollars to go on pilgrimage with a private operator, including the visa charge. But the Muslim Authority charges 1,950 dollars if you are going by plane, and 1,150 to 1,250 by bus. The beginning of Haj rivalry dates back to 2001, when hundreds of Azerbaijani Muslims chose to drive to Mecca rather than pay the hefty sums the Muslim Authority was charging at the time. The National Committee for Religious Organisations, a body established by the president of Azerbaijan the same year, headed by Rafiq Aliev, helped three private tour operators contact the Haj Ministry of Saudi Arabia and obtain their own Haj quotas as a way to offer more competitive rates. Relations between the National Committee and the Muslim Authority have since remained strained, and tensions mount every year in the run-up to the Haj season. Haji Aqif Agaev, press spokesman for the Muslim Authority, told IWPR Azerbaijan’s Haj quota totals 8,000, and the Saudi Haj ministry has exclusively authorised his organisation to allocate places to tour operators – but apparently it only works with those it approves of. Agaev explained that the organisation feels its premium rates are justified by its quality service. At the beginning of January, Sheikh Ul-Islam Allahshukiur Pashazade, who heads the Muslim Authority, said Haj rates could be higher this year due to galloping oil prices, but “thanks to his personal effort and connections”, they have remained the same. “But next year, the rates will inevitably increase,” added Pashazade. Agaev said he believes the Muslim Authority should have a monopoly on Haj pilgrimage services. “The Haj is not a holiday trip; it’s a religious rite. [Unauthorised or private] tour operators should not be involved. They lack the competencies to explain the rules of the Haj to believers,” he said. But Namiq Aliev of Tur Ltd disagreed, saying his firm employs qualified consultants holding degrees from top Middle Eastern religious universities. Ilgar Ibrahimoglu, the Imam of the Jumah Mosque and coordinator of the Centre for Freedom of Conscience and Worship, believes the entire system of administering religious affairs in Azerbaijan needs a drastic reform. He added that competition from a few private operators has done little to dilute the Muslim Authority’s monopoly. “Before, the monopoly of the Muslim Authority was impregnable. Now the market has been divided between the Authority and Rafiq Aliev, whose body oversees the new private operators providing Haj services. These two bodies are still fighting over market share,” he said. Gulnaz Gulieva is an independent journalist and Rufat Abbasov is a Reuters reporter in Baku.